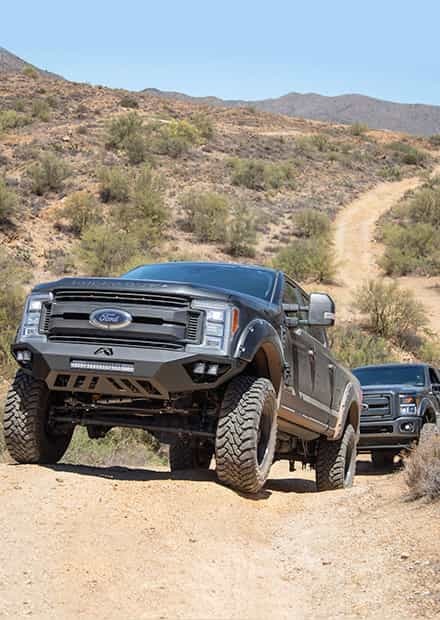 Leveling your truck and getting a smooth factory ride don't always go hand-in-hand. 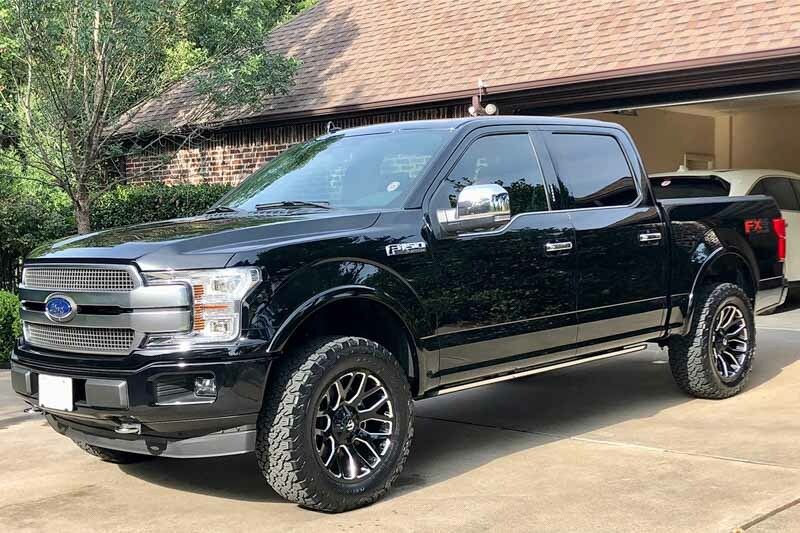 Many aftermarket leveling kits reuse your stock suspension hardware which leaves you with a factory ride and suspension performance at best, if not worse. 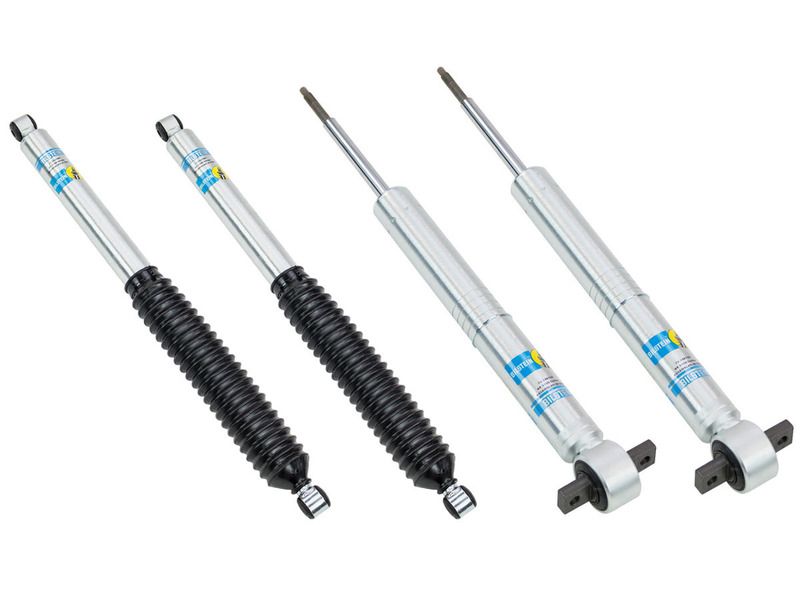 Bilstein, one of the biggest names in performance suspensions, cuts out the middle man with this 5100 shock kit that includes high-quality adjustable front shocks. 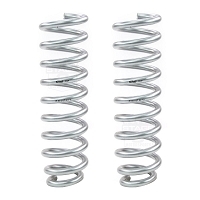 These shocks allow you to set your 2015-2019 F150's front ride height to stock, +.79", +1.26", +1.75", or +2.10" of leveling by using their adjustable spring seat tabs. 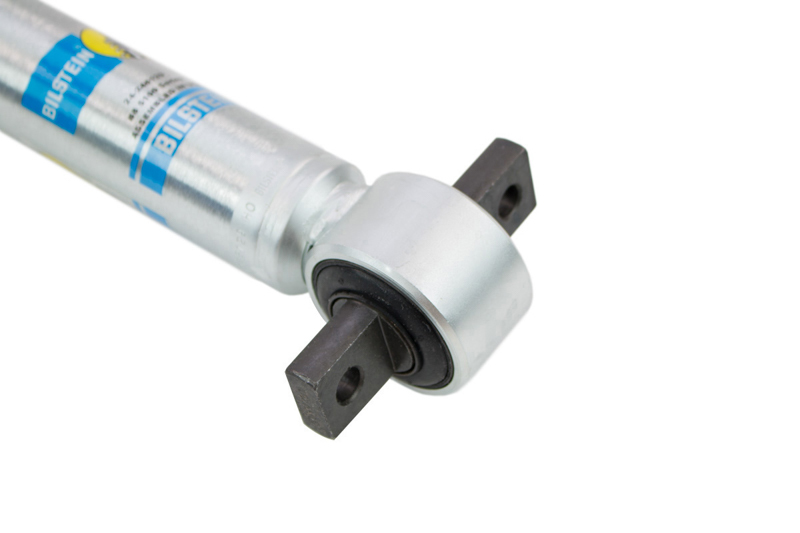 The adjustable design is paired up with legendary Bilstein quality and performance that let you take these dampers anywhere for any application you have in mind without fear. 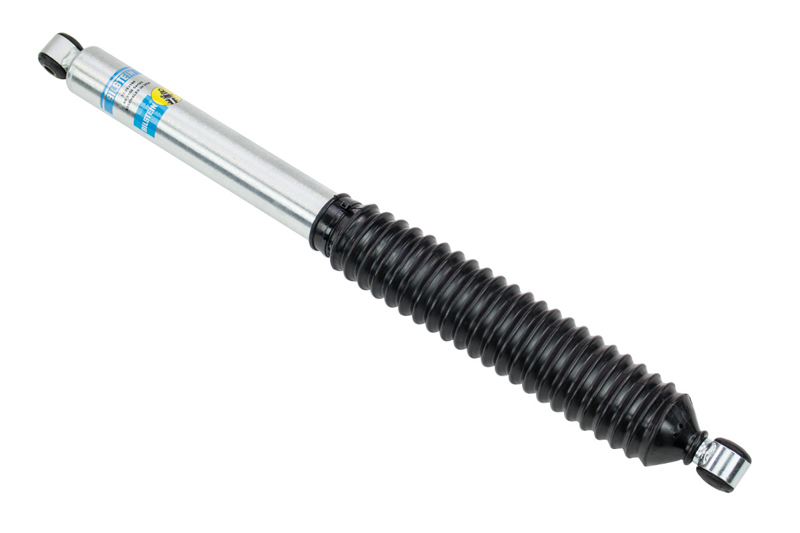 Rear monotube shocks are also included to provide extra stability and handling performance for your F150's rear end. 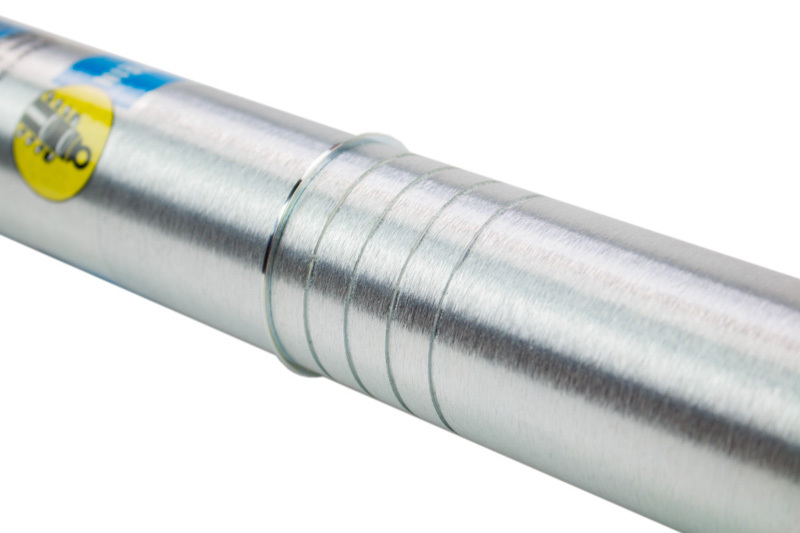 Each of these shock absorbers feature an ultra-strong steel body with a zinc plated finish that protects against corrosion. 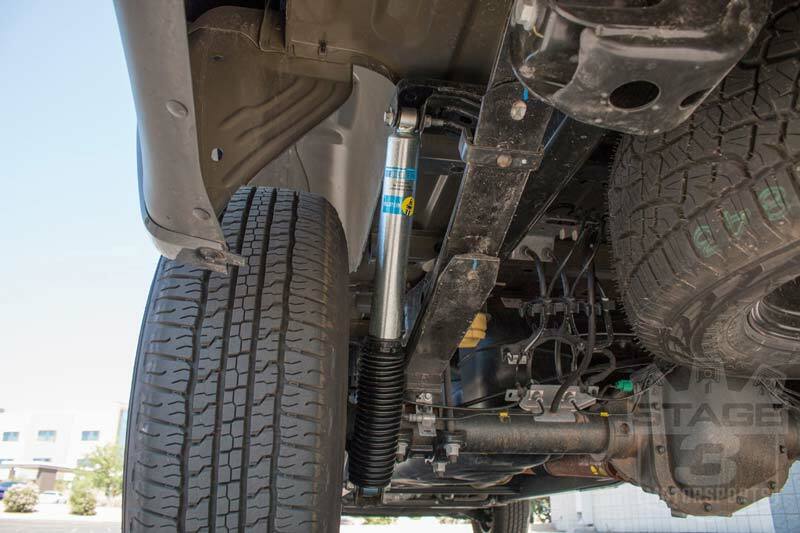 The shocks all feature a monotube gas-charged interior design with a digressive piston and self-adjusting deflective valving which allows each shock to work at varying ride heights and give your truck improved articulation in off-road application. All four shocks feature a large 46mm diameter that gives them a huge oil volume for less fade during heavy and sustained articulation off-road. 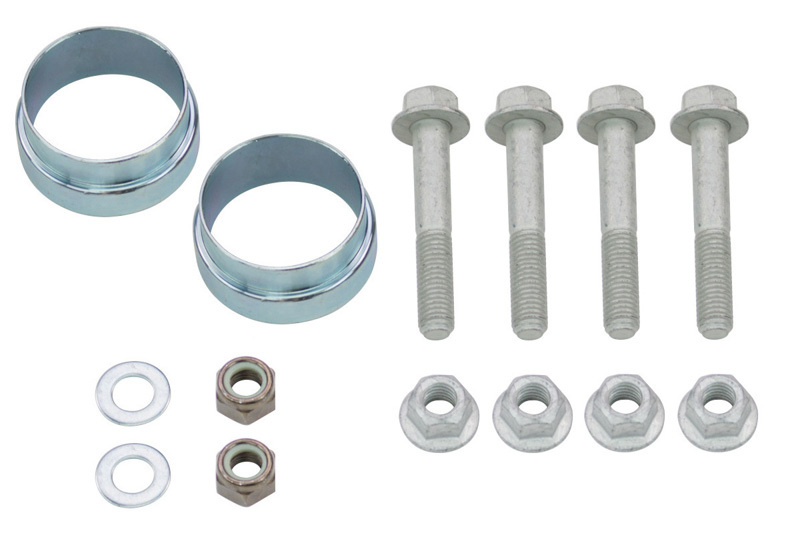 This complete kit is a direct bolt-on replacement for your factory shocks and can be used with your factory front coil springs and rear leaf springs. Fitment: this kit will only fit trucks with 4WD. 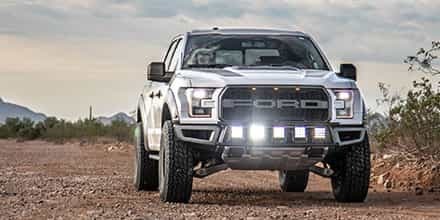 A version of this kit for F150s with RWD is also available. Kit Returns: unfortunately, we will no longer be accepting partial returns of this package except in cases of damaged or defective parts. Please be aware of the installation requirements of this kit and plan accordingly. Please give us a call directly at 623-434-5277 if you need more information. 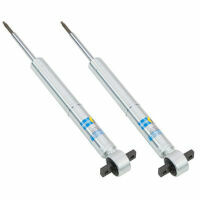 Researched and decided on the Bilstein 5100's to try and get some of the factory rake out of my truck. I've had the truck for a year / 18,000 miles before installing the 5100's. Chose the 5100's because they offer different height settings. I didn't want my truck completely level. Decided to use the + 1.75 setting. Took measurements at the top of both wheel wells before / after for reference. 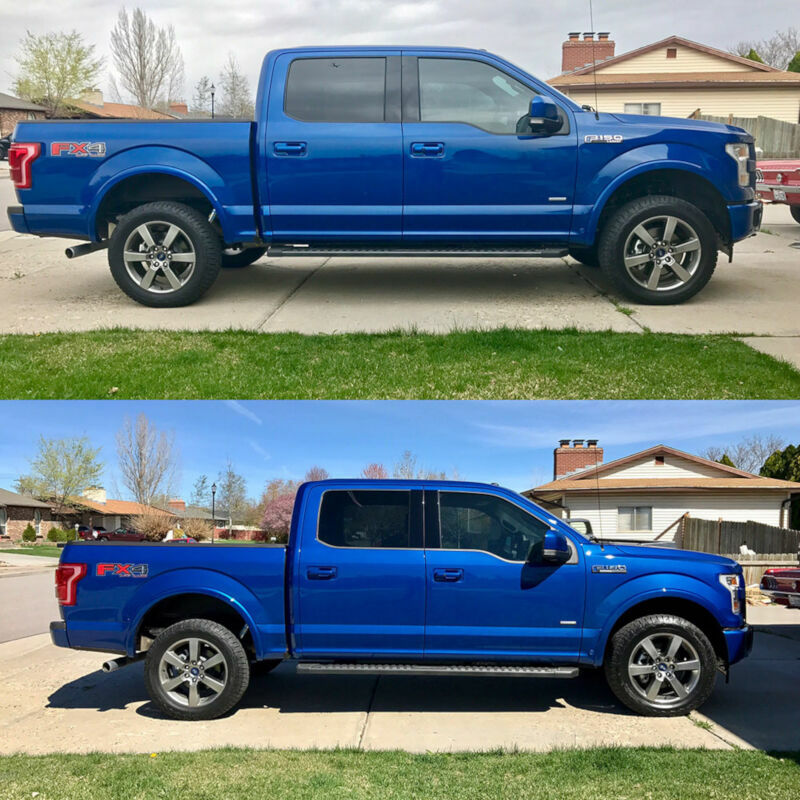 Before: Front 37-1/8 Rear 39-1/2 produces rake of 2-3/8 After: Front 38-5/8 Rear 39 1/2 produces rake of 7/8 It appears the + 1.75 setting on the shock produced + 1.5 of lift on my 2016 F150 with the 5.0L I've driven around 500 miles since the install. No issues with settling. 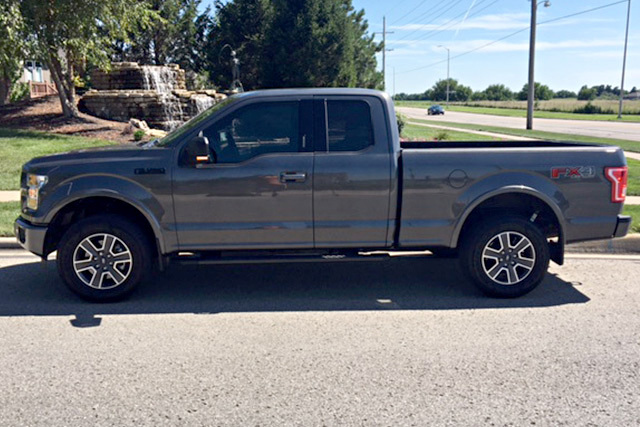 Truck ride is a little firmer than stock without a load - rides really smooth with a few hundred pounds in the bed. I expect the ride to smooth out with a few more miles. Very happy with the look and ride. Worth waiting for the 5100's to fit my truck. Put these on all 4 corners on a 2018 Ford F150 Platinum FX4. Set the front to 2.1. Preinstall I was 37.25 from the ground to the center of the fender. After installation I was at 39.25. I netted exactly 2. Be advised: The 2.7LEB is a lighter engine so you might get more than 2 from these. I believe the 5.0L is heavier so you might get less. Install time was about 4 hours with the fronts taking up about 3.5 hours of that 4. Rears are easy. Alignment afterwards is about $100. Ride is great. Definite noticeable difference out of the rear shocks. Ride is more planted and less jumpy. Front doesn't feel stiff or clunky like some 2.5 spacers. Overall rake is 1 (higher in rear) but given the angle it looks level and nowhere close to nose high. For the price, I can't recommend these enough. Stage 3 had super fast shipping like always and were a pleasure to deal with. These shocks are awesome. 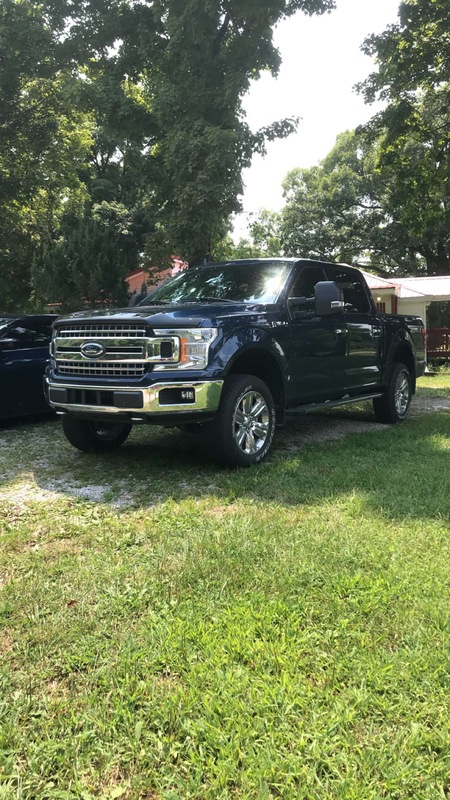 Definitely firmed up the ride quite a bit vs stock, which I think makes the truck much better to drive because it isn't as floaty. I put them on the highest setting and got about 2 of lift in the front after it settled for about 3 weeks. There is still some rake and I think overall it looks really good with 33 BFG AT KO2s. Install was pretty involved but not terribly difficult. You do need a really good spring compressor. It took me about 5 hours for the first front side and 2 for the second. 20 minutes for the rear. CJ Off road has a good install video for Eibach springs which is basically the same thing. That's what I used to guide me. I did the install and with a brother helping we were done in 5 hours. In retrospect, we could have shaved that down to 3.5 but we were in no hurry. The rear remained the same heiht, the front went up almost 3 , they are now even. One thing not covered much is the axle nut, other than on and off to swing the assembly out of the way. Once done, you will need to put it in full 4x4 mode, move the vehicle forward slowly and listen for the hubs to lock in. After that, they are engaged and won't need that again. Also when you get it all done and before removing it from the jacks, you can test the hubs. The procedure for that is: turn the wheel and note that the front axle turns. Start the truck in Park, brake on, again turn the wheel and it should spin free, no axle engaged. In other words, the hubs are engaged unless the engine is running and then the vacuum disengages them. Mike was great in getting the kit shipped to Alaska, really appreciated his help! Shipping was fast. Love the 5100â€™s! Had them installed and set to 2.1 lift and gained exactly 2â€ of front lift. The ride is great, a slight bit firmer than stock but way more controlled and comfy. Added a 1â€ block to the rear for a lil rake back in for towing. Rounded it out with some 285/65r20 KO2â€™s on my stock wheels, gave the truck the bigger more aggressive stance. I would definitely recommend! 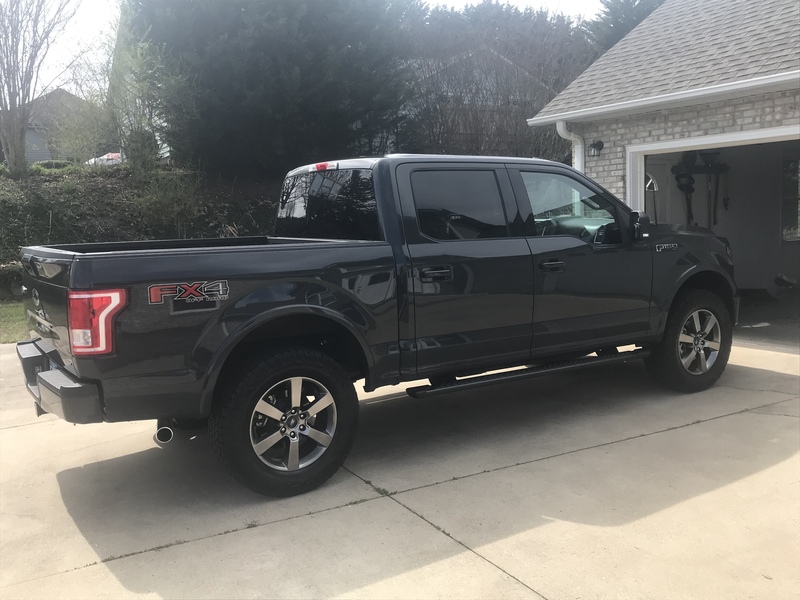 Paid a local shop 3 hours labor for install on my 2018 F150 4x4 Platinum 5.0. Stage 3 shipping was prompt. Have installed these 5100's on my last three trucks and been pleased with the handling improvement. I had them set in the middle setting for 1.25 of front lift. Driveway install took about 4 hours working alone (first side takes most of the time as everyone says). I didn't want to loosen the LCA bolts in an attempt to keep the alignment close, so I cut the factory lower shock mount bolts to get them out. As it turned out they had to shift the LCA during the alignment anyway so no reason to try an preserve the factory location. Basic Harbor Fright strut spring compressor worked, but just barely and the screws were bending a fair bit to compress these springs enough. Used the 4th position (~1.75 lift) and I still have just a little rake which I think looks good and hopefully doesn't stress the upper ball joint too much. Just enough clearance for 33x12.50 tires with 5.5 backspace wheels. The ride with the Bilstein 5100s is just as everyone else describes - firm but not too much and stops the sloppy behavior of the stock suspension with heavier aftermarket wheels and tires. Highly recommended. Set the fronts at 1.75 and the rake is perfect on my truck. After install the ride is much better and doesn't have all that bouncey crap that it did with the OEM shocks. Love em, love em, love em! Best mod money can buy. 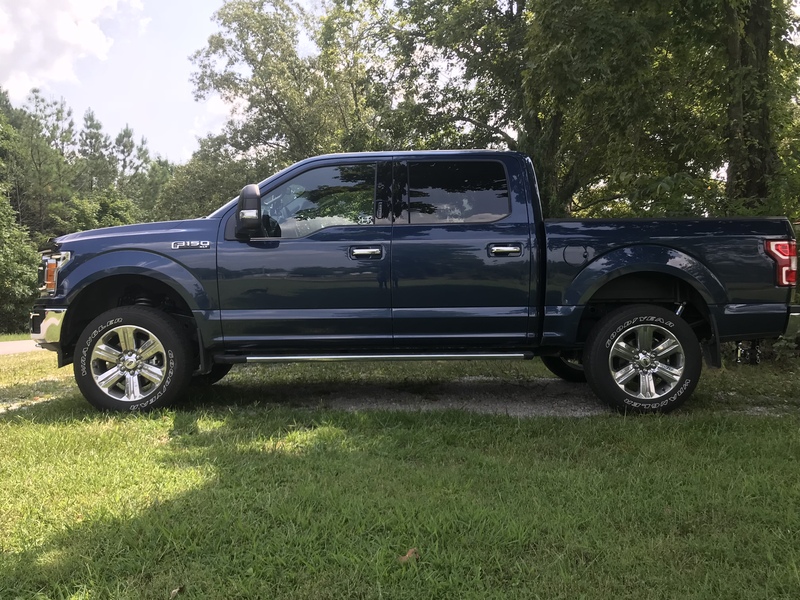 I was kinda hesitate at first, but wanted to level out my truck without the 2 inch spacers, I began to research online and came across Bilstein 5100, so I purchased them (all four) and had them professionally installed. I had them set on 1.75 and OMG my truck looks great. Its flat, its level, its balanced... The measurments are a little under 39 inches in the front and a little over 39 in the rear, (maybe 1/2 inch difference). My wife had been beating me up about how ruff the truck rides, I took her out today and she immediately noticed the difference in the ride... Huge Step-up from the O.E.M. shocks. Rear shocks took approximately 30 minutes. Front removal of strut assemblies took approximately 1 hour for each side. I had a shop compress the springs and install the shock. 2 inches of lift in the front. I regained my rake by installing 3 readylift blocks in the rear. The ride is prrfect. Love the new shocks, can feel the difference driving, ( lot of potholes here) I am on the 3rd perch which is a little over an inch of lift. That combined with the rear block i removed from the rear has the truck almost level now. The install time is about an 3 hours total. Use a good spring compressor, I used a wall mounted spring compressor at an auto garage, it was safe, quick, and easy. Easy install as any shock/strut. 100% better ride over stock! Self installed this and it took a little bit to figure it out but overall quality is much better than leveling pucks.This kit stiffened out the bounce in the back end and rides great. Make sure you have it done professionally or have the correct tools. This is a 4-6 hour job if your doing it in your garage. Heavy duty spring compressor is needed. Good luck but overall a great buy for leveling. Installed on the highest setting, just a slight rake left. Look and ride way improved! All of the factory float is gone and the truck feels firmly planted. Very glad I did this mod. Great price and fast shipping from Stage 3. No regrets here, get a set today! It does what you want it to, levels the truck. 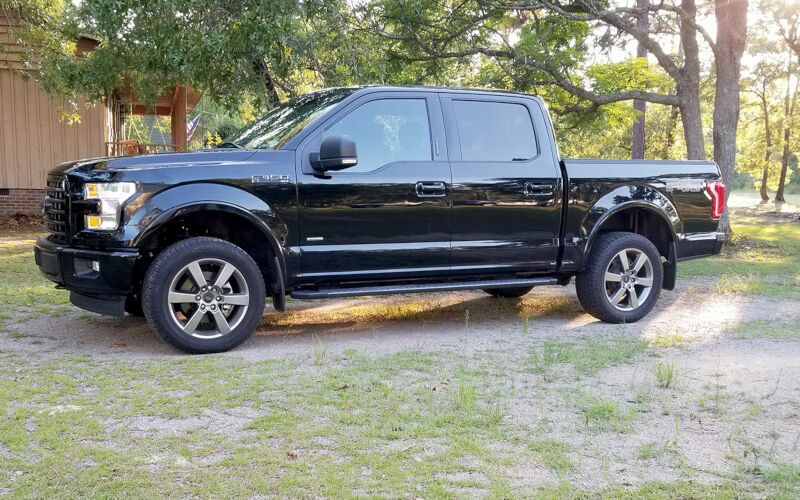 It took about 3 inches of rake out of my 2015 F-150 when set to the highest level. I installed all four, a huge upgrade on the rear shocks, the front are definitely stiff set to the top level, but i don't mind it. Had these installed on my 2010 as well, set one notch down from the top. If you're after a better ride quality, don't go all the way up to the top notch, instead go one notch down. All in all, i'm perfectly happy with it, i knew what i was getting going in and will continue to put this set on all my vehicles. Installed the Bilstein 5100's set at 1.25 I would have liked to set them higher but I pull a trailer with a Polaris Ranger loaded on it and the truck sits almost level with that setup when loaded. 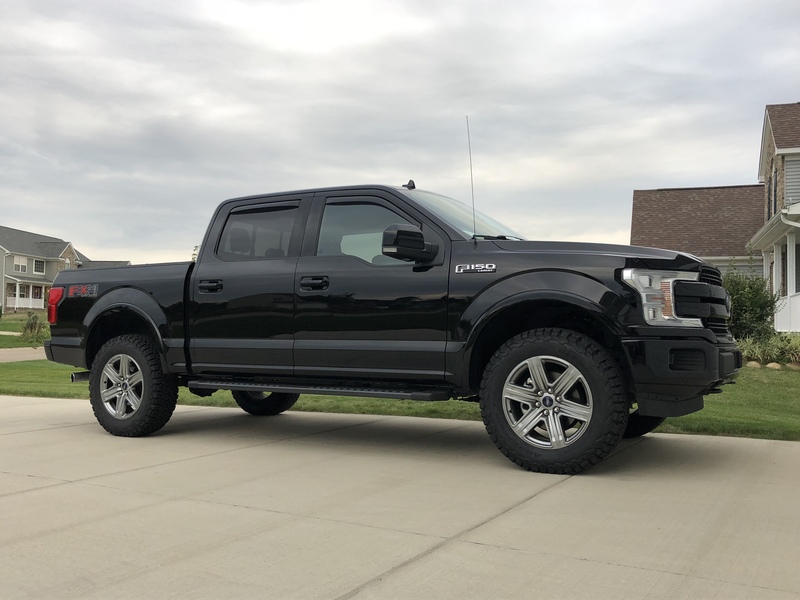 This setting takes about half the rake out of the truck and looks great with the OEM 2017 Raptor take off wheels with Falken Wildpeak AT3W 285/70-17 I installed with the kit. The install is straight forward, no magic here it's just work but as you've read in other reviews you will need a very good coil spring compressor, don't go cheap and injure yourself or worse. I'm also extremely happy with how the truck rides and drives, it's actually an improvement over stock in my opinion. Great product, much better solution than the hockey pucks everyone's using on their trucks. Stage 3 has the best price and service I know of, get you some!!! Great purchase from Stage 3. Best price, fast shipping, usefull online install videos too! These Bilsteins are a nice upgrade to the stock FX4 package shocks. Still a comfortable ride, but more controlled, and the front height adjustment is awesome. Rears were super easy, the first front shock was 2 hrs, the 2nd front shock 1 hr. Really not too bad of an install. I was hesitant to buy these, but the price made me think maybe I should give Bilstein another look. Whenever I compare reviews, I've noticed that the cheaper items get rave reviews, and the deciding factor is usually the price. I'll gladly pay for quality. Somehow, in this case, I got a quality item, at a good price. I've had the Fox 2.0s, the procomps, the Ranchos, and others. I rate these right up there with the Fox shocks. I had around 500 miles on my '17 150 when I installed these, and very happily surprised with the difference. I initially was only interested in the variable height thing with the front, I used the 3/4 setting, to level my lowered 150. For once, the huddled masses were right, these are a top shelf item, very surprising at the low cost. Since my vehicle was new, everything well with installation. Of course the fronts took longer since it requires you pull steering gear apart, and you need a spring compressor. Really though, if you know anything about these trucks, you'll know all that going into it. Rears 15 min, front 3hr + 2hr. The video leaves out import information as to how the axle is reinserted into the hub. You must either pull a vacuum on the auto lock hub or rotate the rotor or risk damaging the mechanism when the axle is tightened - $100 dorman part or $175 dealer. Like many others have said, super happy with this kit. Set at 2.10 and truck sits pretty much level (maybe a slight rake, but barely noticeable). Have about 1,000 miles since install and the ride is a little stiffer and much better than stock. Combined the kit with 275/70R18 Falken Wildpeak At3 tires and the truck looks exactly like I had hoped! I also added the 6,000lb Timbren Rear Suspension kit for when I tow my work trailer (20'x8' enclosed) and travel trailer (~5,500 lbs) to keep the nose from going too high and they have worked like a charm, too. No upsetting passing cars or drivers in front of me because my lights are aimed too high while towing. Love my truck even more now! I installed the rear shocks in my garage, but I had the fronts installed by a local garage. I didn't want to deal with compressing the springs, and I knew I would need an alignment regardless. I spent a few hundred bucks for the install and alignment, but it was worth it to save hours of my time and not risk screwing something up (of course, that's my opinion). Overall, I'm very happy with these shocks. I went with the second highest setting, as I didn't want to be nose high (or close to nose high). The 1.75 setting looks perfect to me, and only has the slightest of rake that I'm sure only I can really see. The ride feels more planted and not as jumpy, but I will say I noticed a bigger difference in the ride quality with the rears than the front. Overall, I'm really happy with how it turned out, and I feel like this is the best way to level a truck. Highly recommend. See my before and after attached. After researching leveling options, I decided on these Bilstein 5100s. I installed them myself set for the highest lift of 2.1. I used a loaner strut spring compressor from the local auto parts store. The install was straight forward and no surprises. The video is very helpful. It took me about 3 hours to do the fronts and maybe 45 minutes for the rear. An impact wrench is a big help but not necessary. After installation, I took the truck to have the alignment checked and it only needed a toe adjustment. The caster and camber were good. 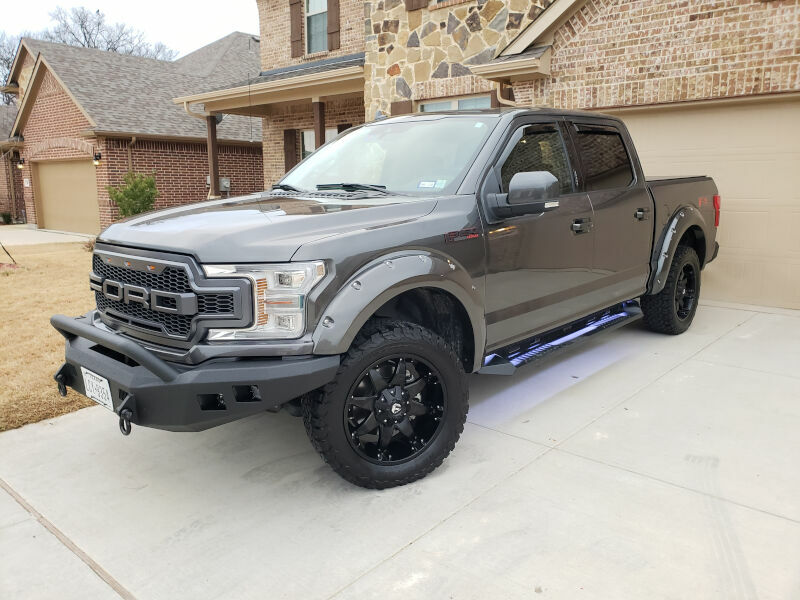 I installed new take-off wheels and tires from a 2018 Raptor. 315/70r17. They fit beautifully. I have not been able to make them rub and believe me, I've tried. The ride is firmer but not harsh. Truck feels more planted and has a little less body roll in the turns. I thought the headlights were perfect after the strut change while it was still on the stock wheels and tires but after putting on the bigger tires, I lowered the headlights because they were too high for oncoming traffic. Stage 3 was great to do business with. The shipping was fast and there was a slight problem with my order as I only received 1 rear shock. I contacted Stage 3 and they over nighted the shock to me. I would definitely buy from them again. I was thinking of paying a shop to install these but decided to tackle them on a Sunday with a family member who owns a body shop. Even with professional tools and his vast knowledge it was still a lengthy and challenging project. Took us about 4 hours to do the fronts and rears. Glad we did it, makes it more meaningful than just writing a check. However, I wouldn't recommend trying to install the fronts unless you have skills and access to the right gear, in particular spring compressors and a heavy duty impact gun to drive them. As for the Bilstein 5100s, I agree with another review that said the ride is firmer than stock but more controlled when you hit bumps so it feels much better overall. I'm going to give the product 4 stars for excellent quality and the improvement in ride quality. I would have gone 5 stars but there's not THAT big of a difference from stock. Overall I recommend the product, well worth the money and effort, or just the money if you don't get your hands dirty. Great service and great product all around. My truck rides very smooth. I fly over speed bumps without stopping like I used to. Great product and great company to work with. Now I need a Tuner and intake. Any reccomendations? Truck looks and drives amazing! It handles the roads much better with out body roll in and out of turns. Feels like a race car but still has a comfortable ride. Very nice product truck rides great was able to fit 33 by 12.5 tires with very little rubbing. The ride quality is much more firm and not floaty. I attempted to try and install myself. Not a good idea unless you have impact tools and a heavy duty spring compressor. I ended up having them professionally installed. Make sure you get a front-end wheel alignment after. Easy install and a solid predictable ride. Leveled out the truck and the zinc looks better than the stock plastic. I installed all 4 myself. Get a good spring compressor (I used HF clam shell style) and an impact wrench with metric sockets. 5 hour job including set up and clean up. Set my fronts to 1.2 inches, love the look and the ride. Love the look and the ride. Took my local offroad shop about 2 hours to install the fronts. I installed the rears in about 20 minutes in my driveway. I set them to the 2.1 setting and it looks great. Still a slight rake but as close to level as I want. Was unsure about tire fitment but I put 285/60/20 (33.5 x 11.5) Goodyear Duratracs on the OEM 20's and they fit great with no rubbing or anything. Stage 3 is awesome. Great customer service, prices, and quick shipping. I'm really happy with the 5100 level kit on my F150. I was concerned about it creating a too rough of a ride for normal street use but the all around ride is great. Firmer in a good way. The truck is much more planted and stable in all conditions with less body roll. The truck sits great with plenty room to fit 305/65/18 BFGs on 18 offset 9 wheels. Stage 3 has best prices I found and super speedy shipping. I'll be a return customer. I had these installed on my 2017 F150 Platinum to minimize the rake without compromising the ride quality. These did the trick! 1.75' in the front looks perfect, it still has a little bit of rake but there is a noticeable improvement in ride quality and it looks much better. I've received a lot of compliments on how much better it looks.. I would highly recommend these if you are looking to level your truck while maintaining good ride quality. Shocks went on the rear very easily and quickly. Improved ride quality over factory. Used the front struts with eibach pro lift springs. Also used 2 inch blocks in the rear. Best price anywhere, crazy fast shipping for free! They feel pretty close to stock to me just better, ride great not stiff. Set them on the highest setting and looks level but I will add a little block on the back so it doesn't go nose high when I tow. Looks almost like it's lifted when you get the right wheels and tires. Rides great, much less bounce. My baby's car seat toy attachment would rattle constantly on the highway, but it doesn't make a sound now. 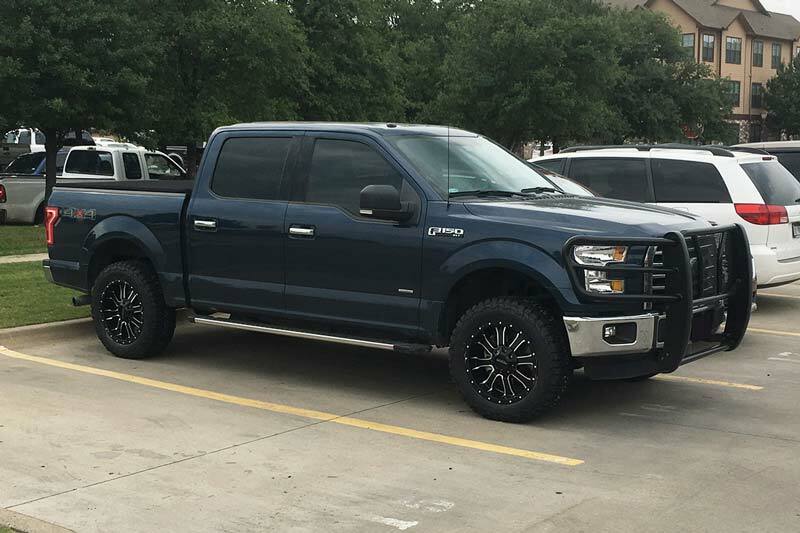 They say it will fit only up to 33s, but I have seen a guy on YouTube (Wicked F150) say he put on 34s without trimming or rubbing. 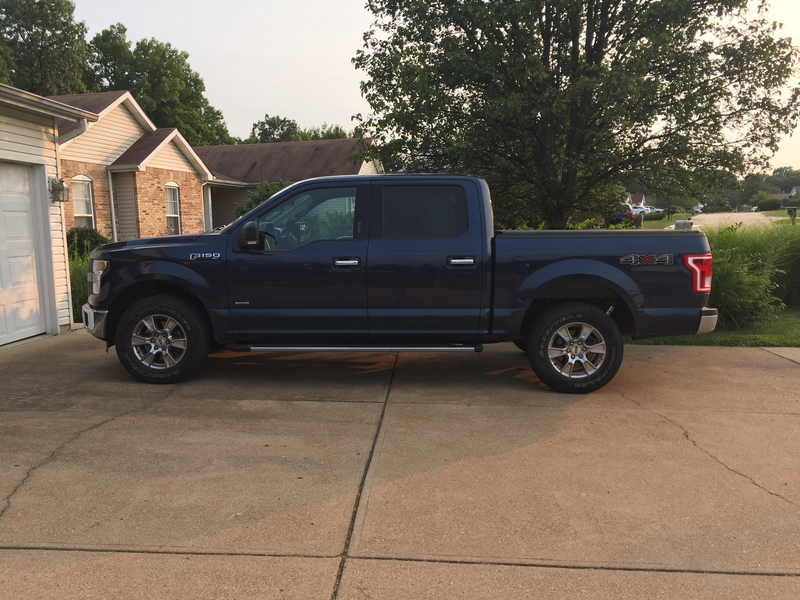 Install on 2016 F150 went great. I set the adjustment at 1.79 the front is a 1/4 lower than rear looks level. Heavy spring compressor is a must. Really improve handling of truck. 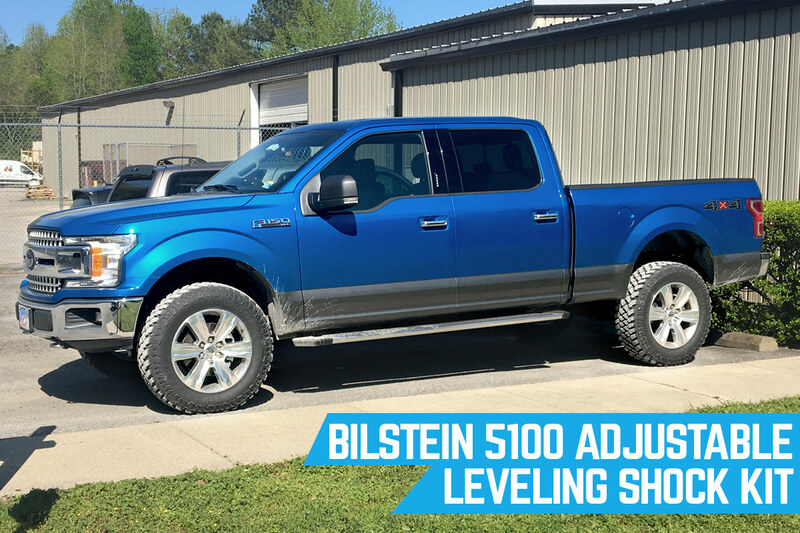 Absolutely love the Bilstein 5100 leveling kit. My truck looks rides and handles a lot better. I highly recommend this kit. Installed this kit last night in under two hours. Granted, a hoist and large spring compressor helped a lot, but it went very well. Put it at the max lift so it sits level and it looks great. Will update if anything changes or seems negatively affected. Should've bought a long time ago. Ride quality is amazing. I put it at the 1.25 setting and took out the rear blocks and loving the ride height. Planning on getting slightly bigger tires to help fill in some more space. Love the ride height and the ride feel. 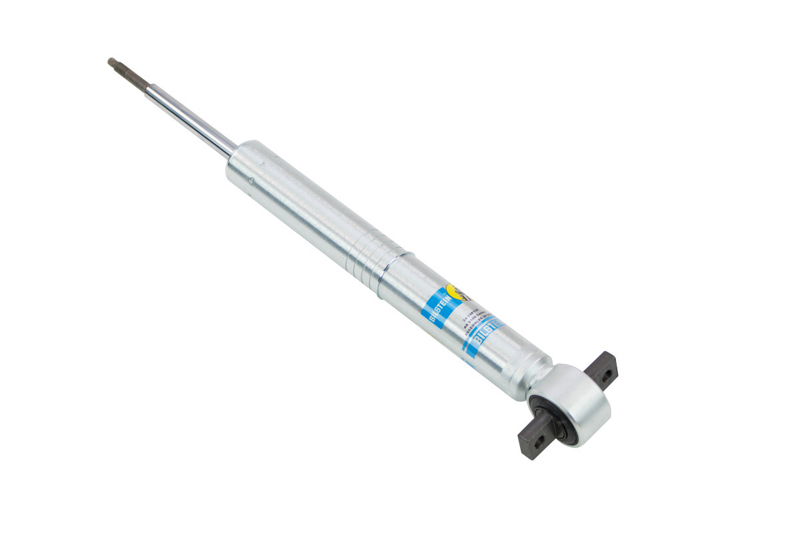 Did a lot of research and decide on bilstein. My old truck I did the puck and after install these I will never use the puck style again. Awesome product! Cost me $400 to have them installed, wish I was more mechanical. Raised the truck exactly 2" in front taking out the rake. Ride is a little stiffer, increasing handling. Was able to fit 275/65 R20s w +1 offset rims, no problem. No rubbing at all!!! Fast delivery!!! Had front and back placed 2 weeks ago. Truck had 70k miles. 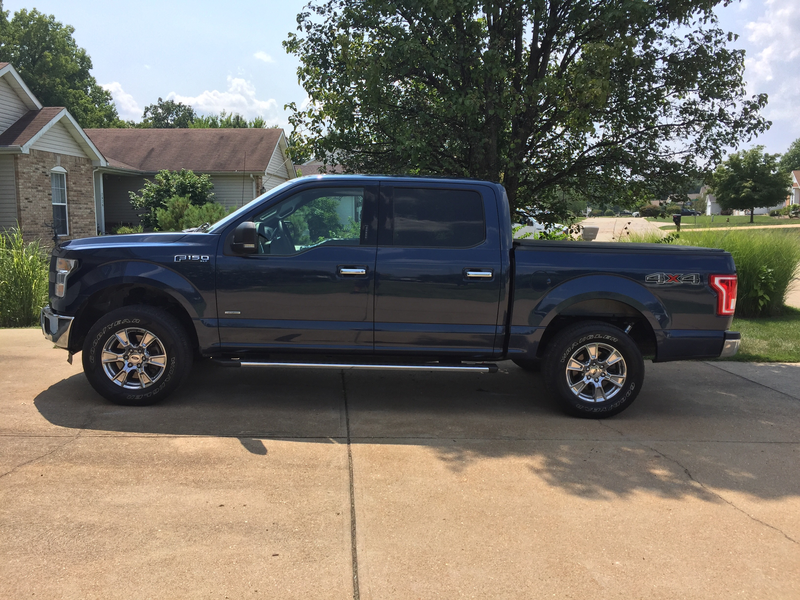 Like new truck! A little firmer but in a good way. Handling perfect. 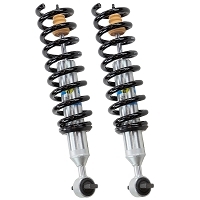 Recommend these shocks. Had professional installation. Could not be any happier. Worked great on my '19, left me with about 1/2" of rake which you'd need a tape measure to notice. Ride is stiffer but don't let that scare you, it's perfect & the way it should come from the factory. This is the best overall "bang for your buck" mod you can do to your truck. Stop looking and just buy it. Couldn’t be happier. Big upgrade over stock suspension. Set front struts to the highest setting, still has a slight rake. Ride is firm but comfortable. Truck feels planted to the ground through corners. Huge different in ride quality and a nice level. Used the top lift setting and I think it looks great. Install time was as anticipated. Quality shocks, quality product. 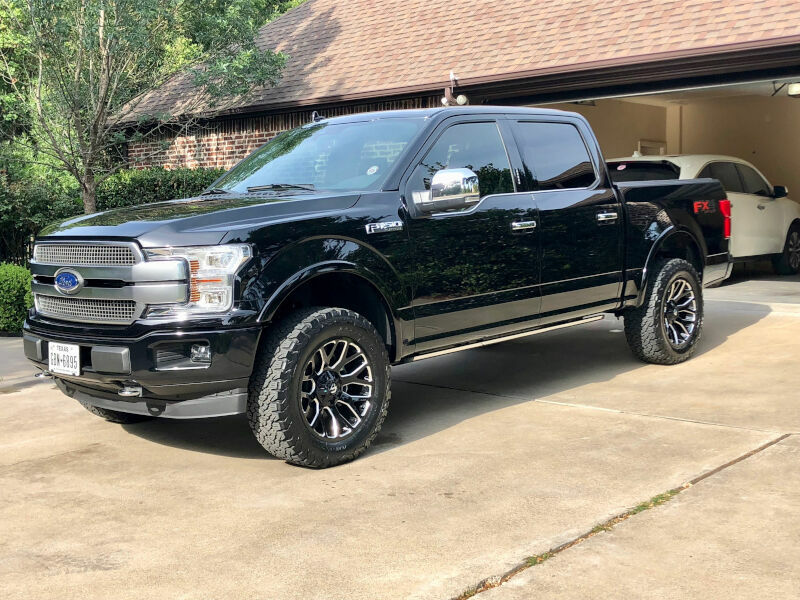 If you're looking to level out your f150 or looking for a stiffer ride this is ideal. Ext cab short bed..put the adjustment at the max it's only 1/2' higher than the rear. Will probably lower it a notch in the future. Installed on my own with guidance of the Stage3 video. Make sure to tighten the shock nut after load is put on. spent a couple of days chasing a clunking sound. The ride has improved considerably. I went to put them on and the snap ring was bent. I called get a new snap ring and they said that you have to send the whole thing back. So over all good product, Just wish that they could send just the parts that show up broken. How do these compare to the Fox 2.0 coilover kit? What is the primary difference in ride quality and driving dynamics on street and on rutted, washboard roads? 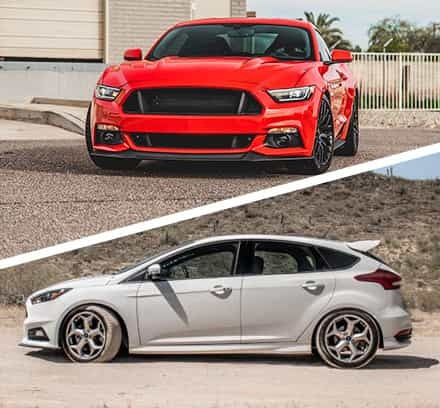 It's not really a 100% fair comparison since the Fox 2.0s are a true front coilover kit, while the Bilsteins are a strut replacement that reuses the stock spring, perches, and mounts. That being said, their on-road ride quality and handling is pretty similar to each other in being slightly more stiff than stock, but they also greatly improve overall handling, reduce body roll, and the rear shocks take the bouciness out of the rear end. Off-road, the Fox 2.0s offer superior performance than the Bilsteins, and can take harder impacts with more composure while suffering less fade at speed. Still, the Bilsteins are less expensive than the Fox 2.0s, and will do fine in most applications. Was this answer helpful? 12 of 12 Found Helpful. What size tire could I fit on the 2" placement ? 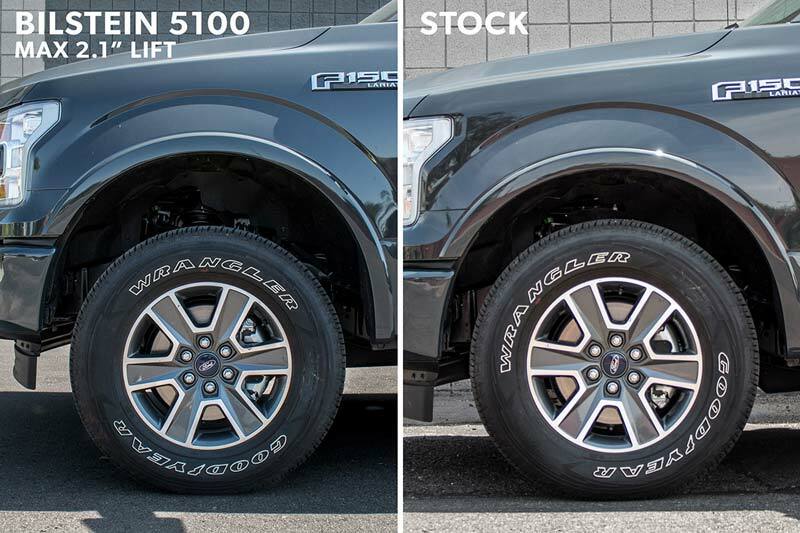 The biggest we recommend with most wheels is a 33x11" tire or a close metric equivalent. Will this make the truck level with the stock rear height? Do I need to purchase rear blocks to achieve a slight rake? The front 5100 struts are capable of adding 2.10" of ride height. In our opinion, it takes 2.5" of leveling to get a "dead-level" stance. You should still have a slight amount of rake when using this kit, and I'd check to see if it's enough for you before ordering a rear block. Is it necessary to upgrade the UCA for the 2.1" setting? I just don't want the UCA contacting the coil and have heard some issues when running the spacer types leveling kits. During normal street driving, you shouldn't see any UCA/spring contact at the 5100's highest 2.10" ride height setting. That being said, the UCA will likely contact the spring at full droop or during full front articulation. 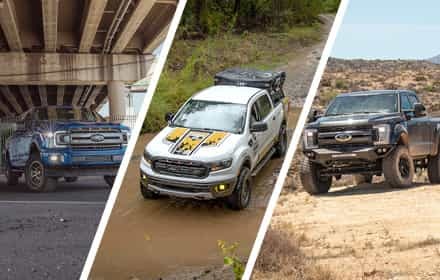 An aftermarket uniball UCA isn't strictly required, but you could grab one if you're concerned or if you're planning on off-roading your truck on a regular basis. Just ordered these for my 2017 F150 Supercrew XLT Fx4. Will the 2.10 setting ride different than the 1.76 setting? Also, will the 2.10 cause the truck to ride nose high? Thanks can't wait to put them on! 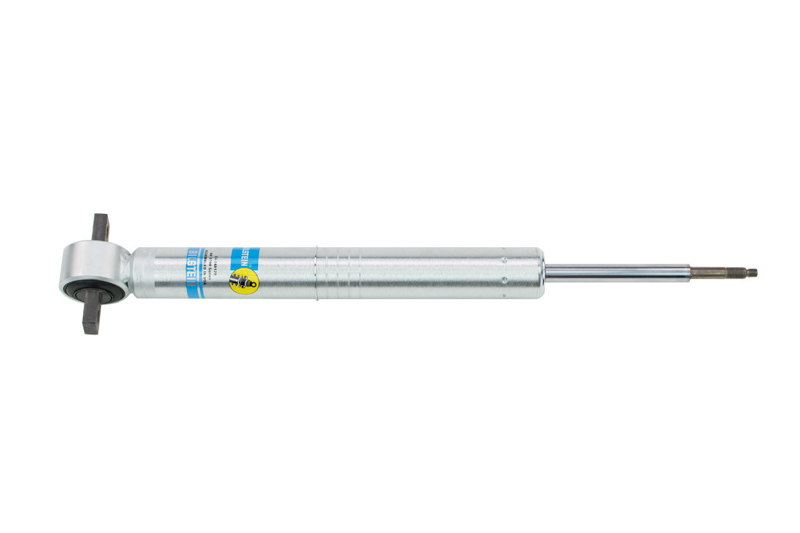 The Bilstein 5100s do tend to get a bit stiffer as you go up in ride height, though the difference in stiffness/ride quality between the 1.75" and 2.10" ride heights will be fairly minimal. At 2.10" of leveling, you should still have a hint of front rake. In general, 2.5" of front leveling gets these trucks to a "dead-level" stance, and you'd need to go higher than that to actually be nose-high. The photos show 4 shocks, but the description only mentions the front. Does the kit include all 4 shocks (front and rear) or only front? This kit comes with both a pair of front 5100 strut assemblies with adjustable ride heights, and 5100 series rear shocks. Will these fit on a 2014 F150 4WD? 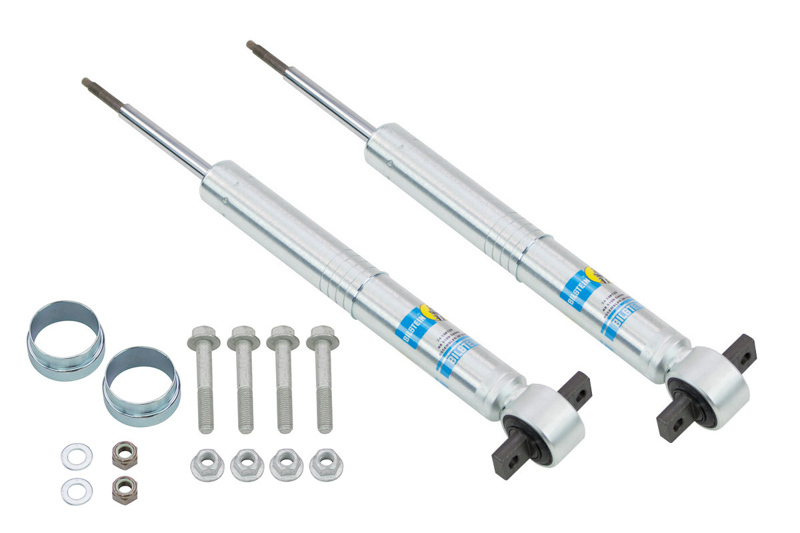 It will technically bolt up, but the shocks and strut assemblies in this kit are valved for use on the 2015-2016 F150s. 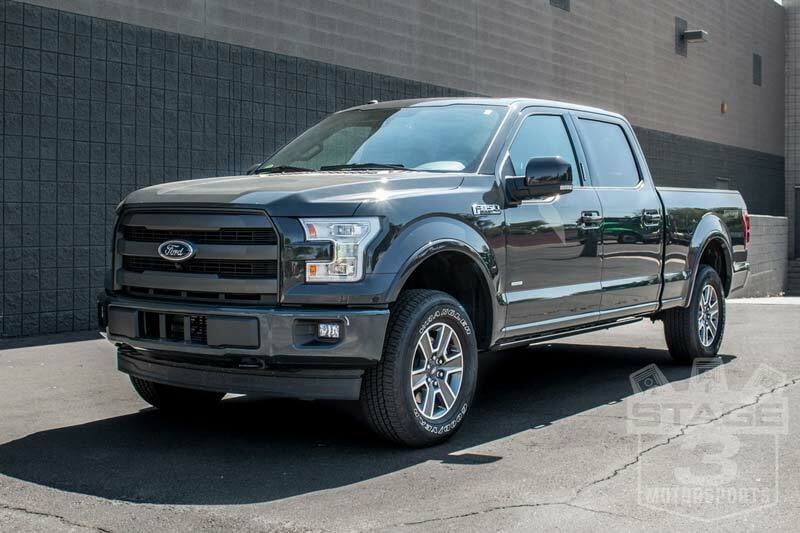 A version of this kit that's specific to 2014 F150s is here. How much actual lift are these providing? I have the AutoSpring 2.5" spacer now and run Toyo ATIIs in 295/65/20 with minimal clearance. Current spacer has my truck dead level. I wouldnt mind going up, but I cannot come down and maintain the clearance for the tires. The front struts are only capable of adding up to 2.10" of front ride height, so you would lose some height with a straight swap. 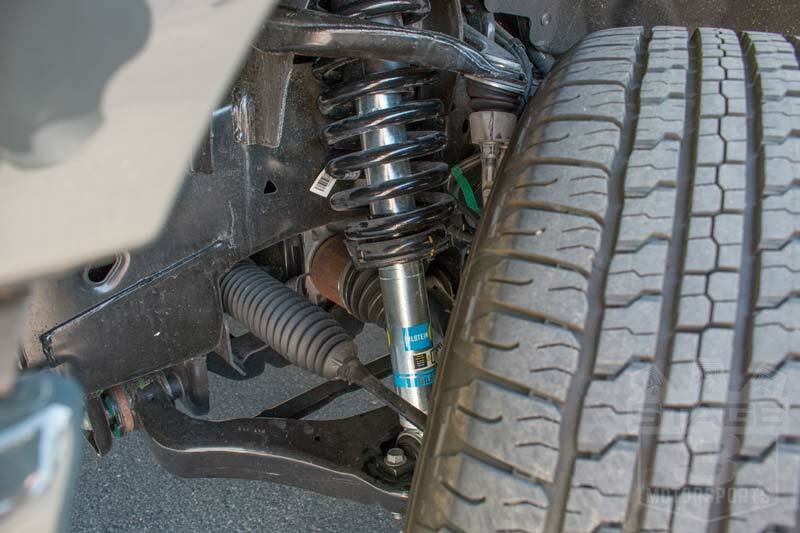 Technically, you could set the front struts at a 0" stock ride height and keep using your Auto Spring spacer so that you get the extra suspension performance while keeping your lift. Otherwise, you'd have to jump into something like the Halo Lifts Boss 2.0 Coilovers to get at least 2.5" of front lift. How much of a concern is wear and tear on components (ball joints, etc) do you need to be concerned about using this kit? I know it will need an alignment afterwards. What long term effects are there? If any? Thanks. In theory, throwing off the angles of the UCAs, LCAs, tie rods, and CVs does increase their wear rates to some extent. 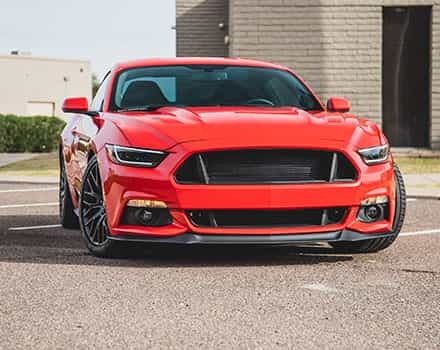 However, in our experience, staying under 3" of front front leveling does not increase the levels of failure for any of the front suspension components. 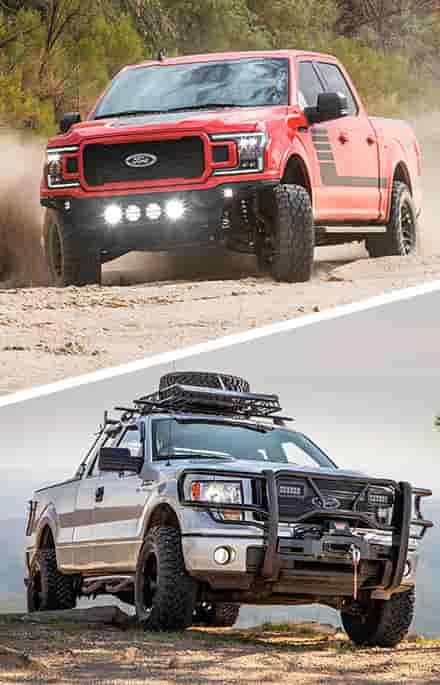 Have they released these for the 2015 F150 yet? 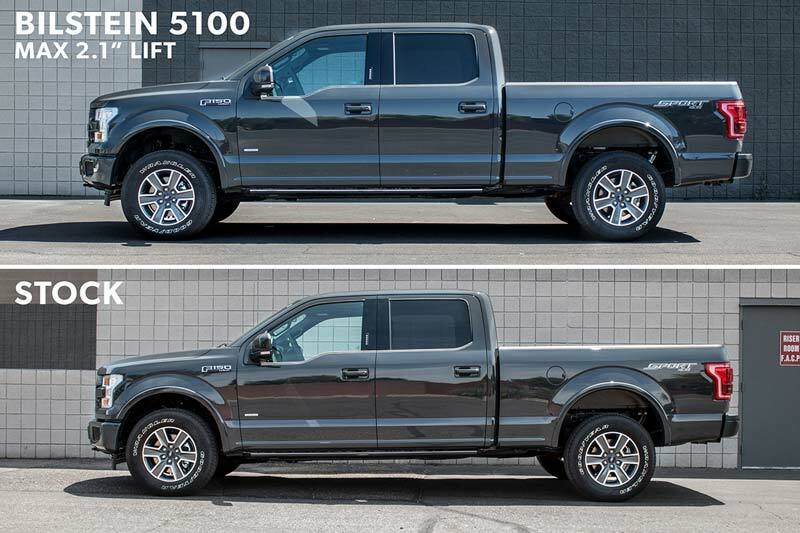 The 5100s for the 2015-2016 F150s have been released, but their availability is pretty hit or miss right now due to the huge demand. Your best bet would be to call us directly at 623-434-5277 for the latest availability and stocking information.